Scientists at the U.S. Department of Energy’s (DOE) Argonne National Laboratory have refined a technique to manufacture solar cells by creating tubes of semiconducting material and then "growing" polymers directly inside them. The method has the potential to be significantly cheaper than the process used to make today’s commercial solar cells. Funding for this research was provided by the Department of Energy’s Office of Basic Energy Sciences and by the NSF-Materials Research Science and Engineering Center at the University of Chicago. Because the production costs of today's generation of solar cells prevent them from competing economically with fossil fuels, Argonne researchers are working to re-imagine the solar cell's basic design. Most current solar cells use crystalline silicon or cadmium telluride, but growing a high-purity crystal is energy- and labor-intensive, making the cells expensive. The next generation, called hybrid solar cells, uses a blend of cheaper organic and inorganic materials. To combine these materials effectively, Argonne researchers created a new technique to grow organic polymers directly inside inorganic nanotubes. At its most basic level, solar cell technology relies on a series of processes initiated when photons, or particles of light, strike semiconducting material. When a photon hits the cell, it excites one electron out of its initial state, leaving behind a "hole" of positive charge. Hybrid solar cells contain two separate types of semiconducting material: one conducts electrons, the other holes. At the junction between the two semiconductors, the electron-hole pair gets pulled apart, creating a current. In the study, Argonne nanoscientist Seth Darling and colleagues at Argonne and the University of Chicago had to rethink the geometry of the two materials. If the two semiconductors are placed too far apart, the electron-hole pair will die in transit. However, if they're packed too closely, the separated charges won’t make it out of the cell. In designing an alternative, scientists paired an electron-donating conjugated polymer with the electron acceptor titanium dioxide (TiO2). Titanium dioxide readily forms miniscule tubes just tens of nanometers across—10,000 times smaller than a human hair. Rows of tiny, uniform nanotubes sprout across a film of titanium that has been submerged in an electrochemical bath. The next step required the researchers to fill the nanotubes with the organic polymer—a frustrating process. "Filling nanotubes with polymer is like trying to stuff wet spaghetti into a table full of tiny holes," Darling said. "The polymer ends up bending and twisting, which leads to inefficiencies both because it traps pockets of air as it goes and because twisted polymers don’t conduct charges as well. "In addition, this polymer doesn’t like titanium dioxide," Darling added. "So it pulls away from the interface whenever it can." Trying to sidestep this problem, the team hit on the idea of growing the polymer directly inside the tubes. 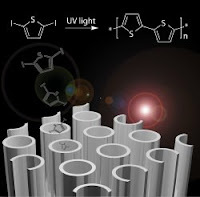 They filled the tubes with a polymer precursor, turned on ultraviolet light, and let the polymers grow within the tubes. Grown this way, the polymer doesn’t shy away from the TiO2. In fact, tests suggest the two materials actually mingle at the molecular level; together they are able to capture light at wavelengths inaccessible to either of the two materials alone. This "homegrown" method is potentially much less expensive than the energy-intensive process that produces the silicon crystals used in today’s solar cells. These devices dramatically outperform those fabricated by filling the nanotubes with pre-grown polymer, producing about 10 times more electricity from absorbed sunlight. The solar cells produced by this technique, however, do not currently harness as much of the available energy from sunlight as silicon cells can. Darling hopes that further experiments will improve the cells' efficiency.